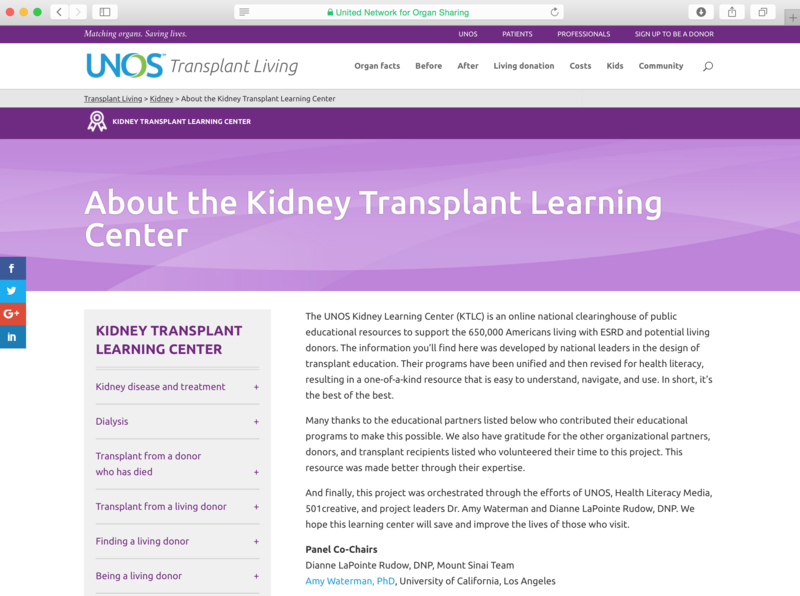 In partnership with the United Network for Organ Sharing (UNOS), a Blue Ribbon Advisory Panel of national leaders in transplant and the design of transplant education from eight medical centers and universities has created the UNOS Kidney Transplant Learning Center (KTLC), an online hub containing educational resources about transplantation and living donation. Explore Transplant is one of the educational programs that contributed content to the site. The Blue Ribbon Panel was initially brought together by invitation to the White House to discuss how to improve outcomes for individuals waiting for organ transplants and enhance support for living donors. The KTLC resulted from that meeting. The KTLC provides access to trusted, quality education to the 670,000 plus people currently living with end-stage renal disease, more than 100,000 people awaiting a kidney transplant, their prospective living donors, and the interested public.